In today’s day and age, it would be incredibly unique if we didn’t look at a screen of some sort during the day. Computers, smartphones, TVs, and tablets all but consume our lives—and recent research proves it. One study found that 90 percent of American’s use a device with a screen more than two hours a day. And, a recent Nielsen Company audience report revealed that American adults devote about 10 hours and 39 minutes a day to screen time. If we assume we sleep for about seven hours a night and spend another three on personal care – preparing and eating food, bathing, and dressing – this leaves less than four hours a day for all other activities. This high amount of screen time affects our bodies in a number of ways including higher risks of obesity and diabetes. However, an often less noticeable and more immediate side-effect is the impact screens have on our eyes. Computer Vision Syndrome (CVS) is directly related to the number of hours we spend looking at a screen. Although staring at the screen does not make our vision “worse,” it can create strain on the eyes which can lead to headaches, dry eye, and blurred vision. One reason for CVS is due to the strain put on the eye as it attempts to focus on screens. As we scroll through the web and watch TV our eyes constantly have to refocus to align with what we are seeing. This action requires a lot of effort from the eye muscles and the glare, flicker, and contrast on the screens makes refocusing even more strenuous. The tired eyes which result from increased strain often are short-lived. However, the blue light emitted through your digital devices has been shown to have lasting negative effects. Blue light produces a higher amount of energy than other shades on the visible light spectrum. This intense light reaches deeper into your eyes and recent studies suggest this can lead to retinal damage and increase risk of macular degeneration. Lastly, this blue light also affects the circadian rhythm and suppresses melatonin, making it harder for an individual to fall asleep after being exposed to it. For this reason, doctors suggest we stay away from screens before bed to help us fall asleep faster. Give your screen a high-five: this is the length at which we should keep our devices to protect our eyes. Blink: we often get so focused as we stare at our screens that we forget to blink. This can lead to dry and irritated eyes. If this already happens to you, keep lubricating eye drops with you and apply them when needed. 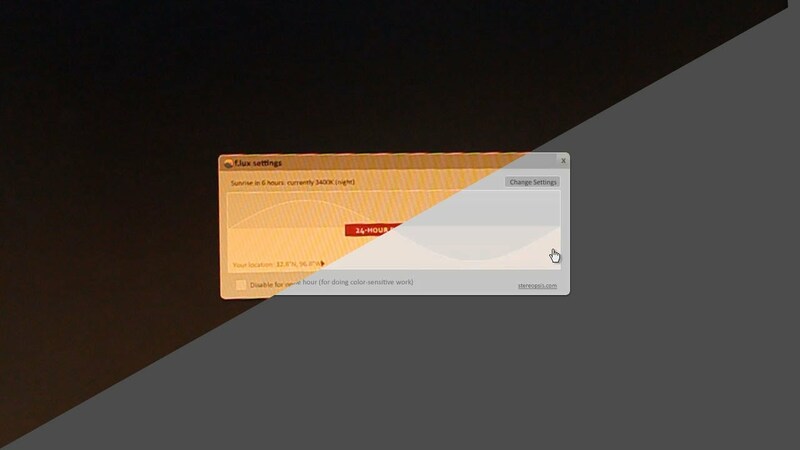 Reduce color temperature: you can do this by simply using your devices less, reducing brightness on your screens, or installing an extension to reduce the amount of blue light emitted by a device. 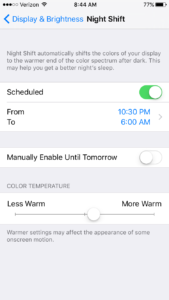 Here is my personal favorite for a computer or android phone – it automatically turns the screen an orange tint when the sun sets and sets it back to normal at sunrise. Although it took about a week to get used to, I definitely feel the effects and even turn it on during the day when I know I will be on the screen for a long time. You can also use this effect on an iPhone—simply go to your settings and under “Display & Brightness” you can schedule the tint to automatically turn on when you want it to.